As China is poised to overtake South Korea to become the world's largest shipbuilder in 2017, experts said Chinese advances in recent years have ended South Korea's technological edge. But they also noted that there might be some wrangling before China eventually becomes the undisputed world champion in shipbuilding. The Seoul-based Aju Business Daily reported over the weekend that South Korea is likely to cede the title of the world's largest shipbuilder to China, which had a significant increase in the tonnage of orders in November, citing industry data. South Korea has held the No.1 spot since 2011, the report said. As of early December, China had 27.05 million tons of orders out of a global total of 74.83 million tons, according to the report. Japan and South Korea were No.2 and No.3 with 15.83 million tons and 15.80 million tons, respectively. Emerging as a low-cost, high-volume shipbuilder, China overtook South Korea during the 2008-10 global financial crisis. Zheng Ping, chief analyst of industry news site chineseport.cn, said that many factors determine a nation's competitiveness as a shipbuilder and South Korea maintained its global leadership with its technological edge. "However, the edge was eroded by Chinese rivals during China's 12th Five-Year Plan period (2011-15). Now Chinese shipyards can build what they could not before, including ultra-large container vessels (ULCVs), liquefied natural gas carriers and luxury cruise ships," Zheng told the Global Times on Monday. ULCVs are super-sized container ships that can carry about 20,000 20-foot equivalent units. Markets for these advanced ships were previously dominated by South Korea's "big three" shipbuilders - Hyundai Heavy Industries, Samsung Heavy Industries and Daewoo Shipbuilding & Marine Engineering. "The catch-up in technology coincides with other advantages enjoyed by China, such as the vast size of its numerous shipyards, its world leading shipping industry and top ports, and favorable government policies," Zheng said. "In the long run, China will be the undisputed shipbuilder of the world," Zheng predicted. In the short term, however, there's a high chance of wrangling between the two countries for the sweet spot, experts said. "The competition reminds me of a point at the turn of the century when Singapore and Shanghai vied for the spot as the world's largest port. The former won a few rounds, as the two ports grew in competition in their throughput, but the title was eventually overtaken by Shanghai," Zheng said. "As ships are expensive, factors such as favorable government policies like subsidies and lending policies, and the value of the currency, all have a big sway in fleet owners' decisions on where to place orders," Zheng said. "It is possible that the South Korean government will announce favorable policies to support its shipbuilding industry to regain the top spot after a loss to China," noted Zheng. 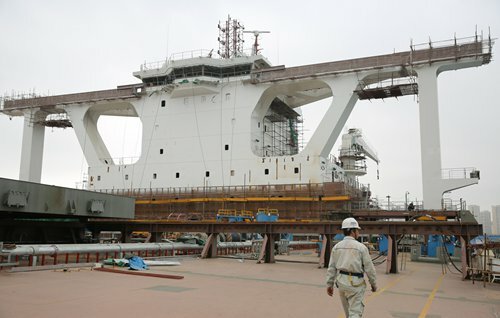 However, a senior Chinese shipbuilding engineer in a Shanghai shipyard who spoke to the Global Times on condition of anonymity said on Monday that management efficiency is another advantage of South Korean shipbuilders, in addition to technology. "Further, there are some supportive policies in terms of order distribution at some Chinese shipyards, and we are facing a diminishing labor advantage," the engineer said. "After the three major shipyards of South Korea tackles their production bottlenecks and fix its problems in their finances, the South Koreans could certainly regain the No.1 status," he said.